A street in the Lower East Side. Photo by author. A structural resistance to chain and big box stores due, again, to the existing building stock. So I’ve been following with great interest the influx around us of high-rises in the past decade, a movement that will reach a crescendo with the proposal to finally build out a long contemplated – and long fought – massive redevelopment in the center of the LES. For most of the previous 50 years or so, since the last of the post-Robert Moses urban renewal projects were completed, the LES retained most of its low-rise urban fabric of tenement buildings with mom-and-pop stores at the street level. True, the neighborhood was hit hard by the one-two punch of NYC’s fiscal crisis of the 70s followed by the epidemic of crack in the 80s. Though not as severe as the South Bronx, there were plenty of abandoned, sometimes burned out buildings interspersed with garbage strewn vacant lots. Both of the LES buildings I’ve lived in during my 31 years here had been empty and scheduled for demolition until early gentrifiers like me came in and gut renovated them. The newer buildings, the mid-20th century urban renewal projects, generally adhered to the much maligned and discredited “tower in the park” approach to urban design in which high-rise apartment buildings were set back from the street and surrounded by open space. While there are some successful versions of this, such as Stuyvesant Town, the majority of them became characterless semi-isolated towers embedded in sometimes unsafe public space. The worst of them, like the infamous Pruitt Igoe project in St. Louis, had to be demolished because they were so dangerous. And from an urban vitality point of view, this concept of urban design abandoned the street, eliminating the activity, safety and community that looked messy and outdated to planners but, we discovered, are the backbone of urban neighborhoods. 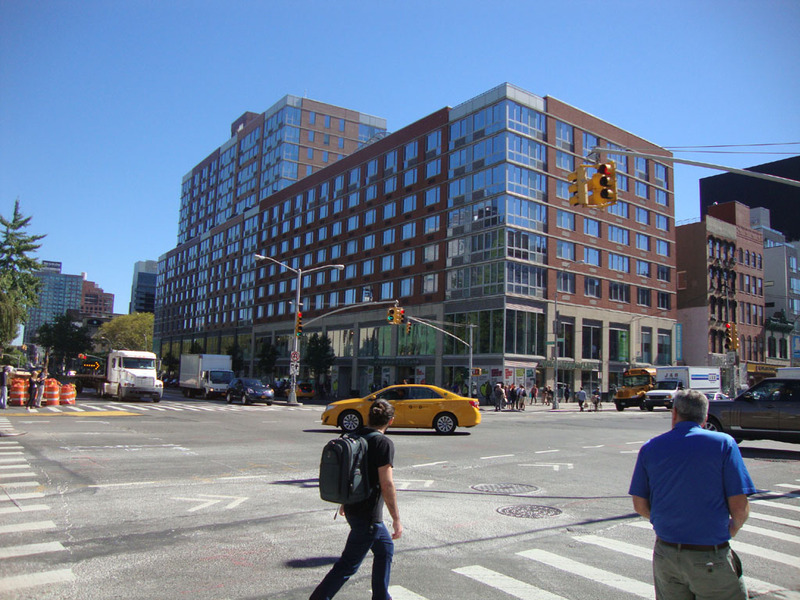 The more recent influx of development has taken the forms of both conventional towers fronting on the major streets (Houston and Delancey streets, and the Bowery, for the most part) and mid-block “sliver towers.” The latter have been very controversial for their practice of buying up the “air rights” of surrounding older buildings and transferring the square footage to the mid-block site, thus allowing these new buildings to be far higher than the zoning would have permitted. More on that in a moment. 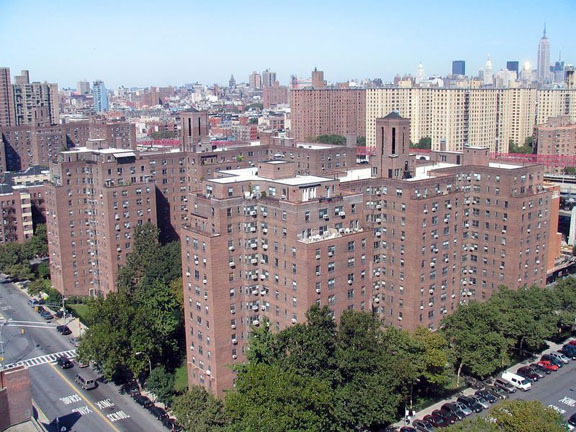 Amidst this, the Seward Park Urban Renewal Area (SPURA), one of the largest development sites remaining in Manhattan, is finally moving ahead. 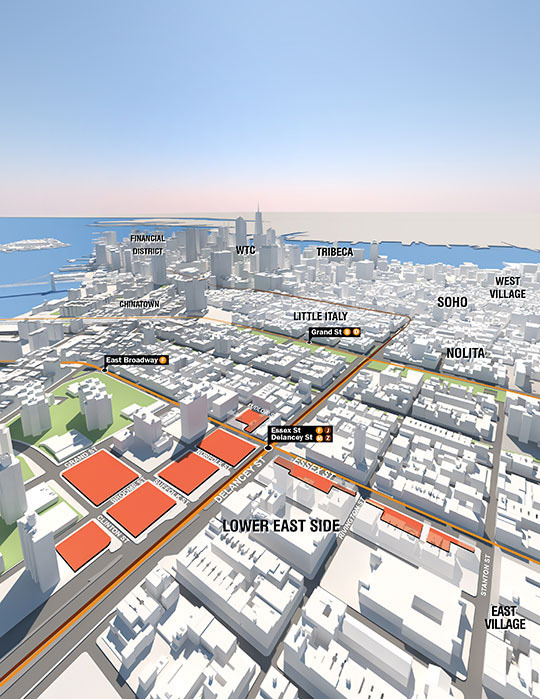 Following an RFP this spring, the NYC Economic Development Corporation awarded the entire project to a developer team (the EDC could have chosen to award any of the nine sites to individual developers, which might have resulted in a less monolithic look) and the proposed design was revealed a few days ago. In some Op-Ed pieces (here is one of them) I wrote during the RFP period, I expressed concern about the urban aspects of the project’s criteria as developed by the EDC. 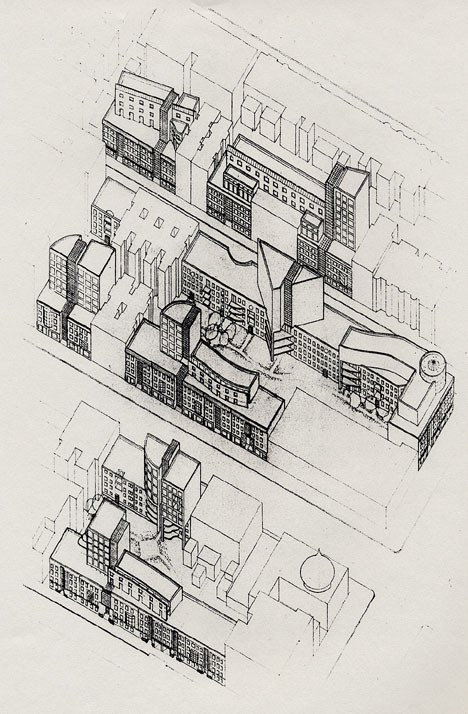 While the local community board did heroic work in demanding affordable housing and limiting big box stores, my fear was that the design proposals would follow the common contemporary formula: whole block buildings with uniform street walls and slightly set back anonymous looking glass towers. Renderings of SHoP Architect’s SPURA proposed design. Images source. SHoP’s renderings, while not as bland as the other nearest redevelopment project, Avalon Bowery, still succumbs to the whole-block building syndrome which, in spite of amenities like roof gardens, results in unrelenting forms that are devoid of relationship to their surroundings. Bowery Avalon. Photo by author. Which begs the question: what’s the alternative? Many would say (as in fact I have in other situations) that the approach should be to take the best of adjoining neighborhood – presuming there are positive aspects to the neighborhood – and improve upon them. This would have the effect of strengthening local roots rather than inserting a wholly new and out of character “intervention,” as this is sometimes called in archispeak. The problem with this approach, of course, is money. Urban land is valuable and construction is expensive, so developers insist on density. On the community side, limiting the amount of housing inexorably pushes up prices, often forcing existing residents to leave. So, as desirable as it may be from a contextual point of view, low density development is not realistic in urban cores. Is there a way to accommodate the economics without forsaking community character? 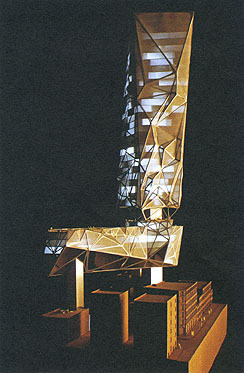 There is and, though it may evoke outcries at first, it’s not far different from the sliver tower concept. I first contemplated this conundrum – how to increase density without losing the appeal of older urban streets – in a design competition back in 1985 for urban infill housing in Harlem, “Reweaving the Urban Fabric: Approaches to Infill Housing.” My entry proposed filling in the vacant lots with new buildings similar in scale to the existing walk-ups, and then adding what in essence was a new layer of shallow towers above. The concept was that the lower level buildings would be primarily for families and the upper levels would focus on smaller apartments for singles, couple and seniors. Multigenerational buildings were not yet a topic, but it was implicit in the idea. Competition Entry by David Bergman Architect for “Reweaving the Urban Fabric: Approaches to Infill Housing,” 1985. And so they set out to combine them in a “best of both worlds” approach that, strikes me as quite similar in concept to my proposal from almost 30 years ago: a street level urbanism Jane Jacobs might approve of with inventive and exciting new urban forms rising above it. Yale School of Architecture student design “The Shroud and the Cloud,” by Benjamin Sachs and Dinah Zhang. Which brings me back to sliver towers. They are generally attacked as uncontextual and unwanted intrusions, and both criticisms are usually accurate. But disallowing new construction and not providing needed new housing is not realistic. Except perhaps in the most significant of historic districts, it simply isn’t feasible to preserve neighborhoods in landmark stasis. Nor is it desirable. Cities cannot be stuck in their pasts as people, cultures and economies evolve. Even Paris, often cited as either the quintessential example of the ideal low-rise city or, conversely, as a tourist destination disguised as a city, is allowing high-rises. 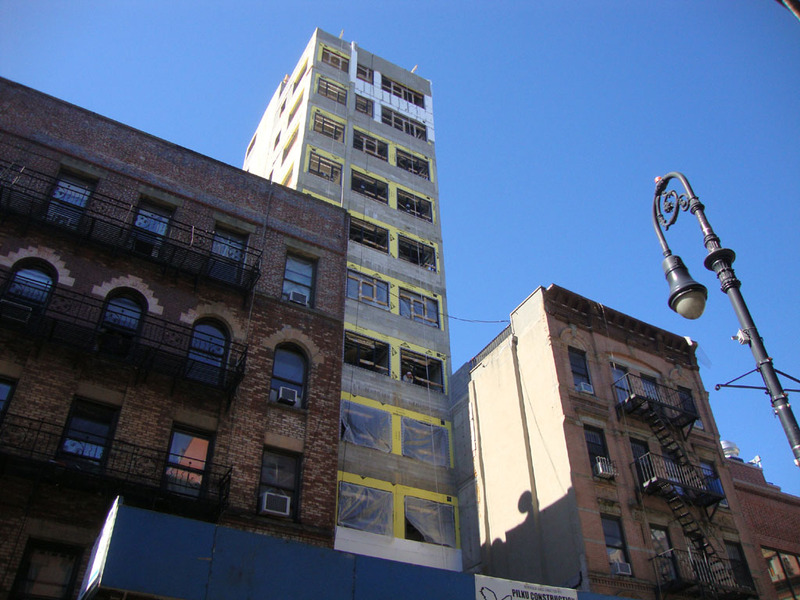 A “sliver tower” under construction in the Lower East Side. Photo by author. So if new construction and increased density is inevitable, how can it be accomplished without sacrificing communities? And let’s go one better. How can it be designed to improve communities? We have a model at hand, and it involves using the often criticized “transfer of development rights” process to preserve the strong urban fabrics while allowing encouraging positive growth. 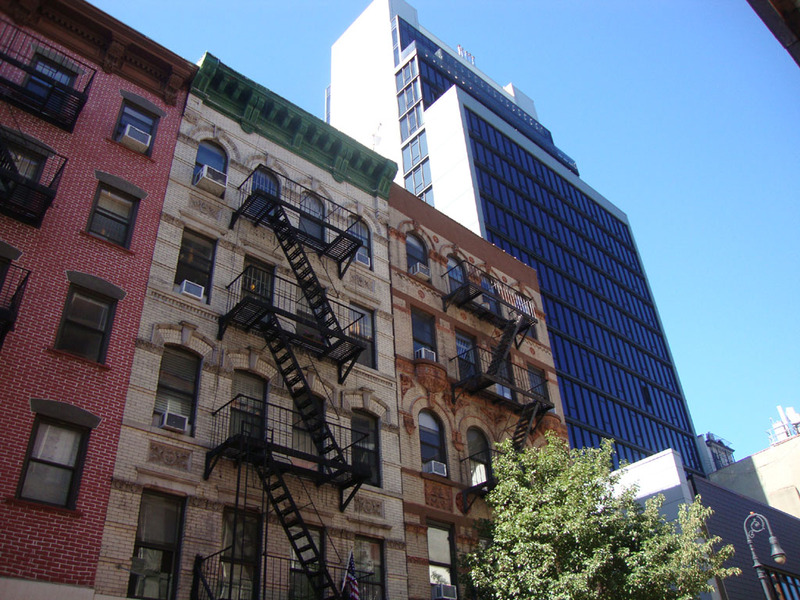 A friend of ours was approached a few years ago to sell his air rights to a developer putting together a mid-block high-rise a few doors away from his building. He held out as a matter of principal while his neighbors sold, and at the time we complimented him roundly. Now I’m not so sure I agree. Yes, the building that resulted is architecturally heavy and, far from adding to the neighborhood, has become a nuisance in that it is a hotel with no connections to the community and its second floor rooftop parties can be hideously noisy. Indeed, a slightly earlier nearby high-rise hotel has exactly the same issues. (Who’d have thought we’d see glass tower high-end hotels in the Lower East Side?) But it doesn’t have to be that way. Mid-block high-rise hotel in the Lower East Side. Photo by author. What we can have, I’m suggesting, is what I term “towers in the block.” Much as the Yale students recently proposed, and as I proposed much earlier, we can modify the towers in the park idea to correct its faults and simultaneously incorporate the wisdom of contemporary post-Jacobs urbanism. But how does this work in the (increasingly rare) case of whole-block construction? SHoP’s renderings for SPURA are basically towers in the block. But, glass tower esthetics aside, by proposing block long buildings, they fail to create a good base over which to put the towers. The street is, to use Pasquarelli’s students’ words, architecturally monotonous. Its nod to contemporary urbanism, beyond some gestures to amenities, is present only in the setbacks on the plinths. 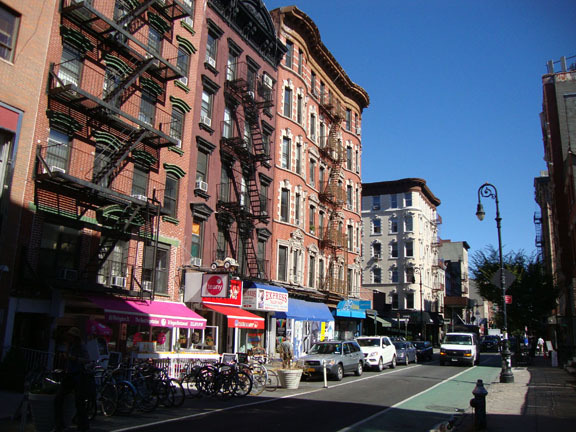 Look at any new building like this, whether nearby in the LES, uptown on Broadway on the Upper West Side, in downtown Brooklyn, or any number of other cities, and the street level is devoid of local character and mindless of community. This is, I want to stress, at least in part an architectural problem. Though zoning may mandate ground-level commercial spaces and setbacks (and hopefully may start to regulate the proliferation of chain stores and big box retail), in the end zoning is not the same as design, and it is designers who have the potential – and the responsibility – to provide the architectural bones in which street vitality and community can grow. Architects need to study (and force their clients to look at) the banality of most new urban buildings, the unfriendly and unrelenting monotony of their creations. The towers in the block concept provides two related models for moving beyond this, one for blocks with existing strong urban fabric and one for larger scale blank slate sites. The latter needs to be informed by, without directly copying, the former. For the latter to work, it needs to look beyond the expedience of large scale uniformity and the architectural hubris of the megablock. It’s not that Bob and Jane are dead. The lessons of both are very much alive and need to be combined. This entry was posted in Uncategorized on September 24, 2013 by David Bergman. the solution is to expand traditional urban cores, not the tower lollipop. While I understand the desire, and that solution can indeed apply in some situations, I don’t think expanding urban cores is always feasible, and it sometimes isn’t desirable. Cities, and even sometimes cores, are often hemmed in by natural boundaries. Manhattan is a perfect example. In other instances, there may be the issue of travel distances increasing and/or the density needed for carfree mass transit not being achieved.